The redevelopments that will see The Real Mary King’s Close take pride of place on The Royal Mile as part of a substantial refurbishment and expansion plan are underway with a helping hand from the RT Hon. Lord Provost, Donald Wilson. West Lothian based contractors; Ashwood Scotland Ltd will be taking charge of the build project which will include the creation a new welcome area and exhibition space as well as the reinstatement of doors on the Royal Mile. 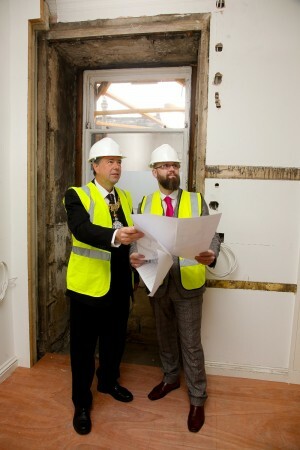 The new entrance will create a prominent on street presence for The Real Mary King’s Close, a first for the attraction. In February, Continuum Attractions announced that it would be investing £500,000 into The Real Mary King’s Close, working closely with The City of Edinburgh Council. 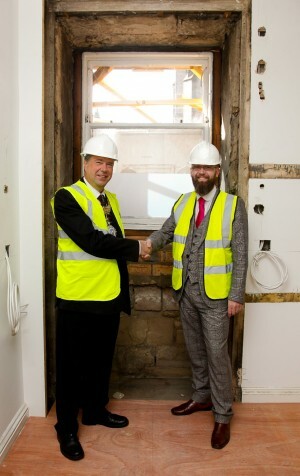 The investment into the five-star attraction is the largest to date, marking a new phase in the Close’s history which is set to significantly enhance the visitor experience both above and below ground. Design agency Bright 3D, whose past clients include the Scotch Whisky Experience, will be responsible for ensuring the design of the redevelopments reflects the heritage and history of The Real Mary King’s Close, which are central to guest experience and the integrity of the site. The attraction plans to remain open throughout the whole expansion process and visitors will still be able to enjoy the full underground experience during this time. The first phase of the new investments will be in place and ready to be enjoyed from June 2015.